Awesome post. Every day I am looking forward to your post and every day again it's a joy to read your post and look at all those wonderful pictures and paintings. 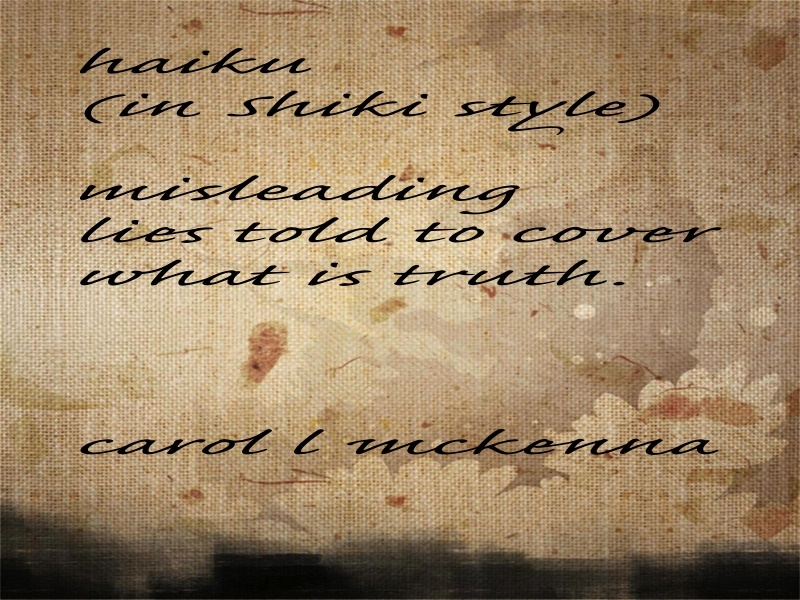 Your haiku inspired on the one by Shiki is very well composed. Thank you for sharing with Carpe Diem. Lovely stuff, this. 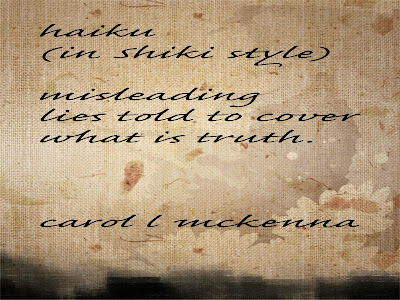 Thank you for being part of Haiku Friday. I love your work. And your Art. always so much to see and appreciate on your page....photos, art, and haiku - all very wonderful, displaying your myriad talents! You find and share the beauty wonderfully ! Have a sweet Friday ! Wonderful post, as always. Being near the ocean is a gift! Looks like your photo on Orange You Glad Its Friday has posted. Sorry if you had trouble. This is the 2nd week in a row Linky Tools has been on the fritz. Not sure what to do. Thanks for your patience! 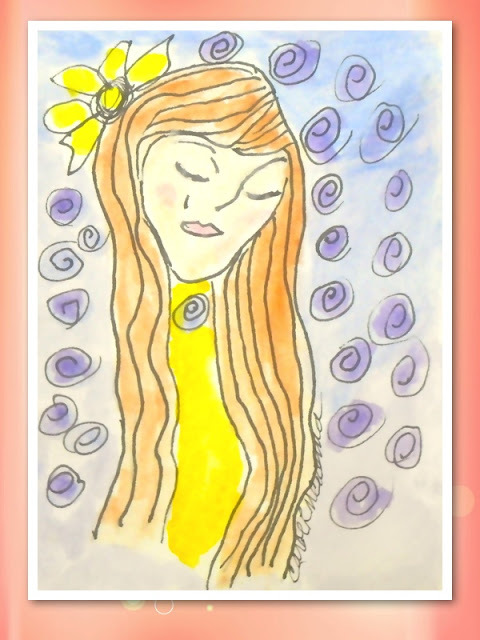 Gorgeous art and beautiful poems! Lovely post! wonderful sketches with a dreamy quality! 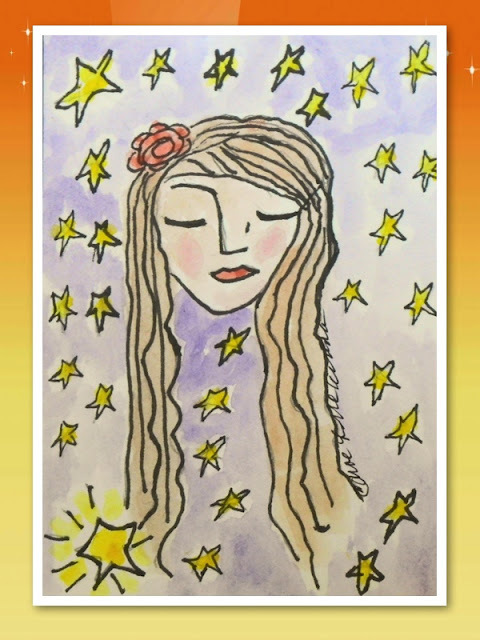 Lovely combination of portraits, poetry and photography, Carol! Came for Haiku My Heart. Saw many other meme posts. Do you do brunette mermaids? Looks like your home is a beautiful place. Your springtime haiku has me longing for warmer days. I'm visiting fro PPF, Carol. I enjoyed seeing your lovely redheads in pen and paint. Very beautiful. Also, I like the haiku that's on what looks like leather. love your haikus and your ladies are so cute!! 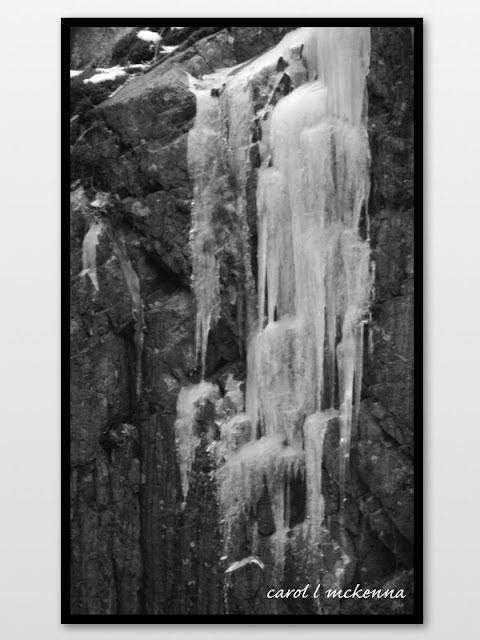 Beautiful frozen waterfall in "Winter on Cape Ann". Some kind of press (most of it I would say) came to my mind reading your smart haiku. My -- a full day of memes. So much to look at! what a gorgeous robin image! and the stunning frozen waterfall, so love it! Sweet bird, I'd like it to visit but I don't think we have them in NZ. Hello Carol, Redheads and redbreasts today! 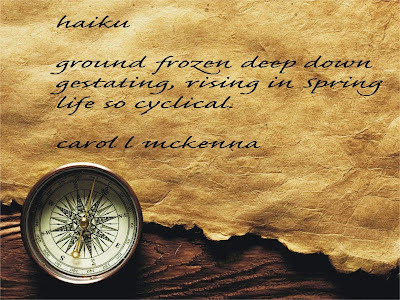 And your lovely haiku that reveal the cold you are experiencing, but promise of spring, and the truth... 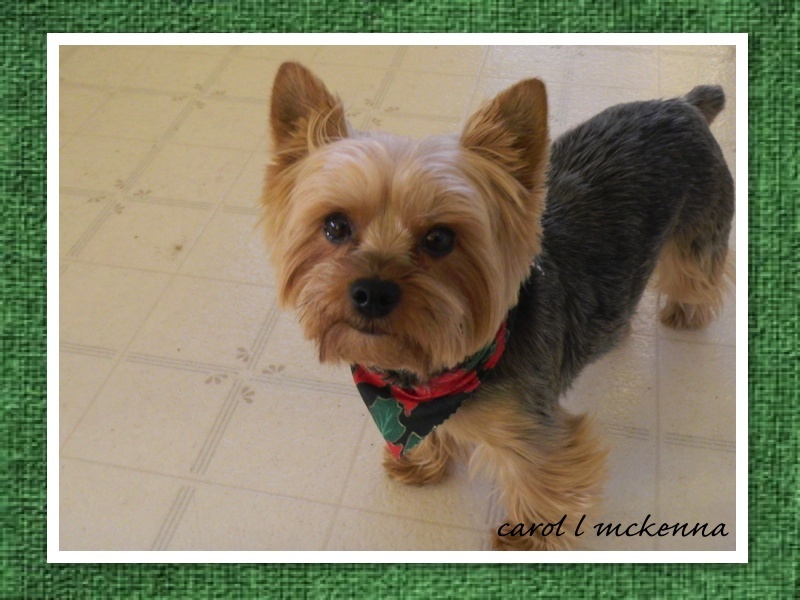 Please tell art muse dog how grateful we are that he allows you to take his picture of his sweet face! I love the way you capture the ice fall. Perfect for black and white. Also like the illustrations, haikus and the photo of the bird as well as the photo of your adorable dog. Inspiration post. Have a creative weekend! The cycle of life is really inescapable, isn't it? Fantástica imagem da cachoeira congelada, belo p&b! Um abraço! I think I say this everytime after each visit, but I love your posts! Your redhead series is great! Great B&W! I also like your haiku. 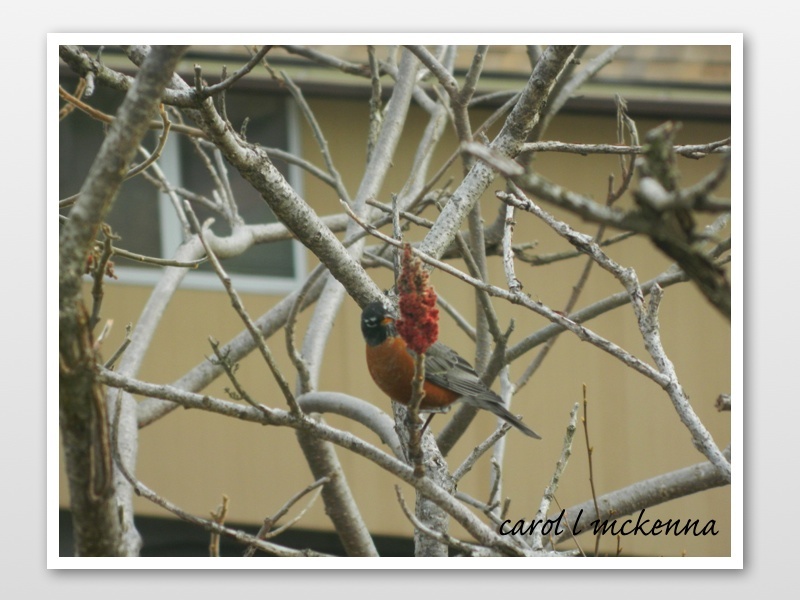 I think you have all the bases covered -- photos, artists, poetry (love Haiku) and critters. Cute little Yorkie. Happy Critter Day! Great post, love the redheads and your cute puppy dog. Have a happy weekend! Carol...it's always so fun to come here and see the various offerings you've made for us. Delightful. Another lovely post! Your dog is adorable. Love the monochrome ice! You have the cutest dog!! I particularly love the photo of the frozen waterfall. How the water freezes like that is a source of wonder to me. Your redheads are adorable!!! I love the winter photos too. The ice on the rocks is really awesome. I love all of the shots...the Robin is lovely. I am now following you and have joined you everywhere I could. I hope to do Paula's blog hop next weekend. My hubby was home this time and I didn't have the time. There is just so much here to like and enjoy. Thank you for all of your creativity! The redheads are just filled with good fun! thank you for your post of beauty and treasuring what lies in each unfolding moment. so beautiful; acceptance and being present. you are so welcoming, with your offerings of awakening and peace. Love the icy falls. Your drawings are really cute! So much beauty here! Love the coming home story too. HPPF ! Your dog is super cute. Enjoying your artworks, other shots and lovely words. That icy waterfall is just unbelievable! Beautiful! I love the shot of the robin as well.